The UK Register of Career Development Professionals is the single national point of reference for ensuring and promoting the professional status of career practitioners across the whole sector to other members of the profession, their customers and employers, as well as policy makers, funders and all other stakeholders. Joining the UK Register of Career Development Professionals (Register) demonstrates that you are professionally qualified in a career development subject to a minimum of QCF Level 6/SCQF level 11, adhere to the CDI Code of Ethics and undertake and record a minimum of 25 hours CPD each year. You can then call yourself a Registered Career Development Professional and use the RCDP logo. The Register is a UK wide point of reference for ensuring and promoting the professional status of career practitioners across the whole sector to other members of the profession, customers and employers, as well as policy makers, funders and all other stakeholders. The Register isn’t just for private practitioners. It is for everyone providing career development services, including managers and trainers. Private practitioners use it to advertise their services via the Find a Career Development Professional facility. If you are employed you can also do this by adding your personal profile showing what services are offered by your company. To further promote the use of the Register we will have an online Directory of Registered Career Development Professionals, which will be used by employers. schools, colleges and learning providers looking to find registered professionals in their area. community of practice served by the CDI and a range of other conferences, meetings and online CPD. 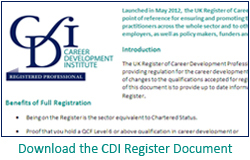 The CDI provides the means to record and reflect upon CPD; access to CPD Resources for online learning, publications and training events categorised under all seventeen NOS: CD; free webinars; Communities of Interest; qualification provision and information; Career Development Progression Pathway; Alternative Qualifications and Competency routes to the Register. CPD recording is monitored by the Professional Development Manager each year. Drafted at the request of Careers England, the paper has resonance for the whole UK and uses the Network for Innovation in Career Guidance and Counselling in Europe (NICE) typology of activities that comprise the skill base of the careers professional: Career information and assessment expert; Career educator; Career counsellor; Programme and service manager and Social systems intervenor and developer. The new Careers Strategy published in December 2017 and the Statutory Guidance published in January 2018 and updated October 2018 encourage schools, colleges and other organisations to use the UK Register of Career Development Professionals to identify qualified practitioners. An annual re-registration fee of £25. We are now able to offer a new type of membership, Registered Professional Member. You must be a member of the CDI before you can join the Register. Alternative Qualifications (in areas such as careers education, human resources, youth and community, professional studies, business development and professional development) equivalent to QCF Level 6/SCQF Level 11 or above and who can provide robust assessed evidence of competence equivalent to QCF Level 6/SCQF Level 11 or above in career development based on the current National Occupational Standards: Career Development (NOS:CD). Endorsement of these qualifications for the Register is a costed service of £145 plus VAT. Practitioners with S/NVQ Level 4 in a specified career development qualification can be conditionally registered as long as they achieve the three specified QCF Level 6 units or HE Modules before 31st March 2020. On completion of the units conditional registration can be converted to full registration. Anyone wishing to have this combination of qualifications or the alternative qualifications route recognised as being equivalent to QCF Level 6 must join the Register before 31st March 2020. Be currently practising as a career development professional, recently qualified or seeking employment in the sector. This includes managers and trainers. UK Register of Career Development Professionals was launched in May 2013. As of January 2019 there are over 1600 people on the Register. Registration is voluntary, although supported by the Government as a means of regulating the market. The Register is promoted in the December 2017 Careers Strategy and the 2018 Statutory Guidance. 25 hours of CPD is required annually to maintain your registration. More information about the above can be found in UK Register of Career Development Professionals - The Benefits and Requirements of Registration (February 2018).